Script by Christos Gage and Victor Gishler, art by Rebekah Isaacs, Lee Garbett, David Lapham, Paul Lee and Cliff Richards. All illustrations are ©20th Century Fox. This article deals with Dark Horse Angel & Faith material published in oversized hardcover books (12.4 x 8.3 inches or 31.5 x 21 cm), printed on thick glossy paper, with a bookmark ribbon. This is the second volume of season 9 (see also the end of this article). Angel & Faith Season 9 Vol 2 was published in August 2015 (ISBN: 978-1-61655-713-3, cover price $29,99, 280 pages) and edited by Scott Allie and Sierra Hahn. 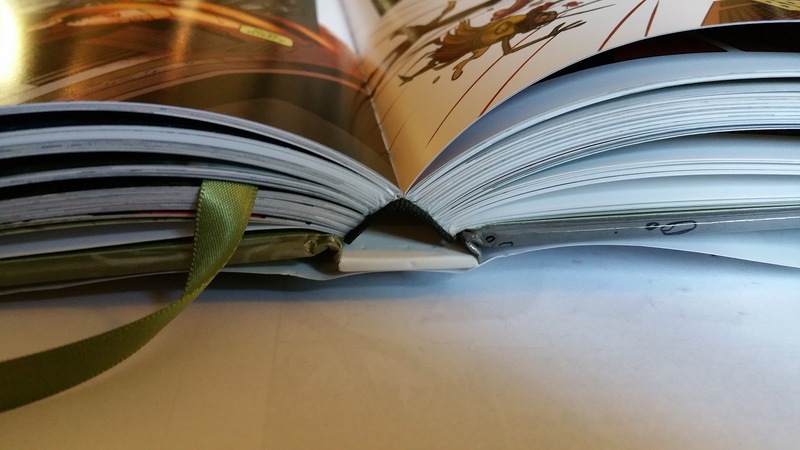 This edition is designed by Justin Couch and here, we have a green theme design (bookmark included). Second and third of cover feature the same illustration. Below, a picture for size comparison with a regular floppy comics (Season 9 issue #15), and a zoom of the high quality binding. This edition comes with an illustrated dust jacket and front inner cover, both illustrated by Steve Morris (also in charge of the chapter breaks art). Back inner cover is illustrated by Rebekha Isaacs. There is no introduction to this book nor afterword but a two pages creators bio at the end. This volume reprints Angel & Faith Season 9 issues #11 to #15 and Spike: A Dark Place #1 to #5. Detailed story credits and contents are displayed below. Chapter breaks art using all regular virgin cover illustrations are from Steve Morris (with 'greened' art by Rebekha Isaacs at the end of each chapter). This volume finishes with 33 pages of extra material including an exhaustive cover gallery (see the list below) and a fully illustrated referenced art section (sketches, thumbnails, layouts and Christos Cage script excerpts).